Seabury Thermostatic Roman Tub Filler with Handheld Shower. 4-hole deck-mount installation. 3/4" thermostatic mixing valve. GROHE TurboStat Technology. GROHE SilkMove ceramic cartridges. 8 3/4" diverter spout. Hand shower. 79" hand shower hose. Volume control included. Flexible stainless steel braided hoses. Service stops. Sold less handles. 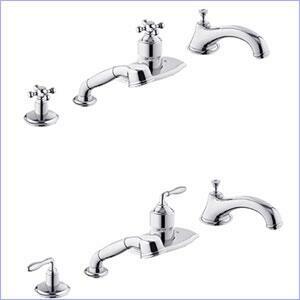 Shown with both Seabury cross handles (19 205) and lever handles (19 204). These handles are exclusive to the thermostatic tub filler.